Check out Careers at H.E.B. 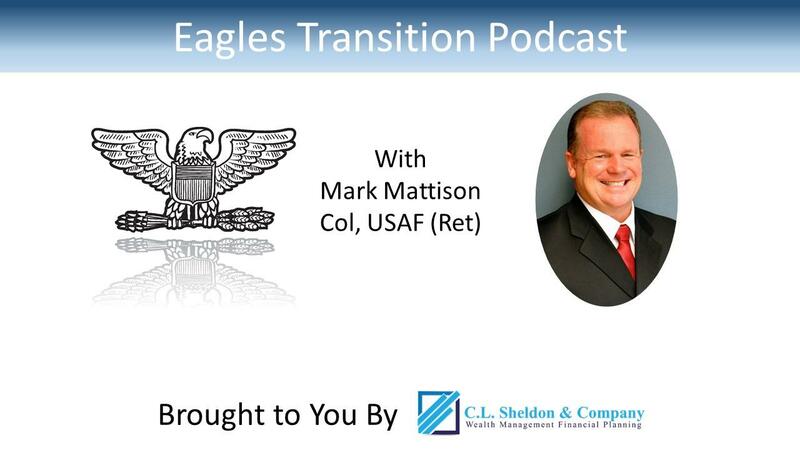 Curt Sheldon: Welcome to the fourth episode of the Eagle's Transition Podcast. Today, I'll be talking with Mark Mattison. Mark, like a lot of the people I know was a fighter pilot in the Air Force and like most fighter pilots he has a callsign. So, you’ll hear me call him Snapper. Curt Sheldon: Snapper is the leader of a multi-team organization. And, I’m going to let him explain it beyond that. Unlike in the first three episodes, Snapper is still with the employer he started with after retirement. He credits that to paying a lot of attention to culture. Snapper also worked the networking process hard and has some good insights into the job interview process. Make sure you listen to what he says about both those topics. Curt Sheldon: But before I talk with Snapper, I'd like to make a special offer for our podcast listeners. If you go to www.CLSheldon.com/eagles, that's www.CLSheldon.com/eagles, you can get a financial checklist to help you with your transition from active duty to the civilian world. It is designed for you, and you can get it for free. Now, on to the show. Curt Sheldon: Snapper, welcome to the show. Mark Mattison: Thanks. I'm glad to be here. Curt Sheldon: Hey, Snapper. Like always, I like to talk to folks about where they have settled after they retired from the military. I know in your case it's the Air Force. Why don't you tell us a little bit about your current position? Mark Mattison: I landed with a company that is growing very fast. I'm the number two executive in a company that does $78 million in sales a year. We fluctuate around 300 partners, as we call our employees. We're open from 6:00 AM to 1:00 AM, 362 days a year. We take off Christmas and Easter, and we close at 2 o'clock on Thanksgiving so our partners that are working that day can go and have a good holiday with their family. But every other day of the year, it's 6:00 AM to 1:00 AM. We average about 4,000 customers a day walk through our business. We sell about 50,000 items a day, and between 1:00 AM and 6:00 AM, the only hours we're closed, we restock the shelves, all 40,000 items, and start again, or 50,000 items and start again. Mark Mattison: By the way, that is one H.E.B. grocery store. I'm what they call a store director, perishable leader, which in the rank of things is number two in the store. When the big guy's not there, I run the entire operation, and it is a complex and dynamic beast, much to my surprise. Curt Sheldon: Now, I'll have to admit I didn't live in Texas that much. I guess I just went to pilot training there, so I wasn't that familiar with H.E.B. as a corporation. Obviously you're a store that's in with some pretty big numbers. Talk to me about the overall corporation real quick. Mark Mattison: Okay. To be honest, that's not a big store. The one I'm at right now is kind of a holding pattern before the next job in my development on my way to being a number one. But H.E.B. is a private corporation, family owned and partner owned. The family gave about 10% of the ownership to the partners that work full time and up to 1,000 hours a year. The company did 25 billion in sales last year with 400 stores in Texas and last I knew, 55 in Mexico. Kind of spreading from north to south from the US border and Mexico and changing the way that grocery happens in Mexico. The numbers I gave you, none of those include the Mexican operation. Curt Sheldon: Okay. So, US only. You're currently the number two in a grocery store. I'm gonna maybe jump ahead a little bit, but I gotta say that's a little bit different for an 06 I would say. What led you that direction? Mark Mattison: That's a great question. That's one of the things I would tell myself if I went way back. Bottom line is I wanted to ... you need to make three things that you need to understand about yourself before you even start looking for a job. One of them is ... and I'm sure people hear this all the time, but I did this, and it led me to H.E.B. What do you want to do? What kind of work do you like to do? For me it was try to make a profit. I know that sounds funny after 29 years of not making a profit in the US Air Force, but I did get to do it as a recreation officer in the beginning of my career, and I loved trying to drive sales and make money. Mark Mattison: Number one on my hit list of three things I was looking for in a job was lead large organizations, but I realized I needed to caveat that with, whenever I talked to somebody from the civilian world, after I learn your business. Number two on my hit list was be responsible for a profit and loss statement. Again, after I learned the industry that I joined or after I learned that specific business. Number three was continue to serve. Mark Mattison: It's kind of funny that I didn't focus purely on those three goals, but I think it was after I was hired, and one day it hit me when I was driving to work, "Oh my gosh. I hit all three of those perfectly with the company of H.E.B." Very service oriented leadership type of a company. Gives more back to the community than any other company in Texas. I don't want to make this into an H.E.B. propaganda spiel, but the company is very big on people leadership and serving partners, customers, and then the greater community. For me that's kind of what led me to H.E.B. Curt Sheldon: Okay. It talks about where you are. Why don't you real briefly, what was your last position in the Air Force? Mark Mattison: I was a Regional Commander for the southwest region of Air Force ROTC. I had 36 ROTC units spread from Mississippi, which doesn't sound very southwest, but Mississippi all the way to Hawaii. As far north as Vegas and Berkeley, believe it or not. It was a beast of an area, but my job was to command all those lieutenant colonels and colonels that were out there at universities running ROTC units. Bottom line is I went out and visited, and gave speeches about core values, and made sure everybody was following the rules and following the plan to build a great new generation of officers. Curt Sheldon: Okay. Great. We've kind of book ended it. You started it out as a recreations officer, and you ended you as a commander of a ROTC region. What was kind of the in between stuff? Mark Mattison: I was loving being a recreation officer and making money, but I kept watching the guys flying airplanes and asking myself, "Why am I not doing that?" Didn't know anything about it. Nobody in my family flew. Nobody in my family was in the military. Once I got in, I realized you can actually apply as a non-rated officer. So I applied for pilot training, got selected, went through the process, got an F-16. Loved every minute of flying F-16s and teaching other people to fly F-16s. I mean, I just kept getting into other things without me being the one pulling the strings. I ended up doing a NATO tour, going back to doing a training command tour, and a Pentagon tour where I did BRAC and built the Air Force budget. So, just all kinds of different things. Then even went to AETC to build their budget as an 06 out of War College, but did normal staff tours, normal schools. Too many masters degrees, and none of them helped me with grocery, the grocery industry. Mark Mattison: Yeah. From business, to flying, to budgeting and training, and back to flying, and then kind of back to training in the end. I did get a chance to be the vice commander and more often than not the commander of Osan Air Base and was also was the chief of staff or director of staff of USAFE Headquarters for General Welsh, before he went on to be the chief of staff. Curt Sheldon: Okay. Sounds like a pretty interesting career and one I'm sure you're proud of. You're a little bit different than my previous guests. I think you're ... and I know this because we've talked about it before, but I think you're the only one I've interviewed so far who is in the same job essentially that he started with right after retirement. That is correct, right? Mark Mattison: It is. And you know it's funny in ETAP I sat in the back of the room and I listened very carefully. When they said ... they gave a percentage of the retirees that transition and then change jobs within their first three years ... whatever it was. If it was 80% or 85%, I said you know what, I've always been in the top 10% in my life. I do like me. But decided I wanted to be in the other 10 or 15% that found the right job the first time and settled in for a 15-20 year career. It worked out. Curt Sheldon: Great. Again, I've heard some of your stories, but talk to us about how you even opened your aperture to start thinking about working at H.E.B. Mark Mattison: You know, I prepared very hard. I do this ... you've heard me tell crowds of people to take the mission of transitioning every bit as serious as any other mission that they've undertaken in the military and give it every bit of energy and preparation that you would a normal military mission. I actually did that. I spent lots of time on resume and I spent a lot of time preparing for interviews and reaching out to people and networking. That's a whole different topic, but in the end that had me prepared for a very random discussion in my church one weekend. Somebody asked me if I was going to stay in San Antonio and I said sure would like to retire here. They said you ought to talk to that person. And that person happened to work for H.E.B. and I laughed. I said you're kidding me. I'm a fighter pilot/regional commander. What does that got to do with grocery? Mark Mattison: The answer was, “just go talk to her”. I asked the lady to lunch. She was very gracious and kind and met me for lunch. As we started talking about H.E.B. 's structure, the values of the company and what it took to run a grocery store, believe it or not, a lot of it sounded an awful lot like a squadron, a group or a wing in the structure. Mark Mattison: There was a point where I thought, I can do this. Although their starting salary was so low. You mentioned as a retired 06. The starting salary was so low it became very clear to them and to me that probably wasn't going to work. But the process became let's table that whole idea of what hours you work when you're in retail and the amount of money we would pay you and do me a favor and go talk to this guy. What that meant was she gave me a name and a number and I know she called ahead and said hey, this guy's going to be getting ahold of you. Please talk to him about working at H.E.B, about what you do. The guy had eleven years in the military, in the Air Force. He was an accounting/finance officer and then joined H.E.B. and now he's at the top of the game running a big plus store. Mark Mattison: So I went to his store and I walked with him and I asked him my questions. One of which was, very serious to me at that time, tell me how do you know what to charge for a gallon of milk? He laughed and he said, "I don't do that. The company does that and all the prices change overnight on all products that are changing. Otherwise ... and then there's a whole batch of price tags that come out and there's a whole fleet of people that run around in the middle of the night and change those price tags." But he goes, "I don't do that." Mark Mattison: And I got the feeling from him that yeah, I could do it and that the leadership that 06 brings out of the military would be something that the company could use. We repeated that process, the executive I was working with, two more times. I went to two different stores, another one that was even bigger and he was even a more successful leader of a store. And then they sent me to a store that's in a rough part of town and said here's the other side of a grocery business so you know what all's possible. Then they asked me to interview in the end. And in between found a way that I was in a discussion with one of their senior HR folks to discuss salary. Interestingly, this would be something I would tell your folks there listening that are getting ready to transition or are in the middle of a transition is I didn't realize what I was doing. I wasn't in a negotiation in my mind, but I did lay out a minimum for what I needed. Mark Mattison: Thankfully, I had prepared. I listened to you. I listened to the ETAP coach and I built a budget and I looked at it and refined it and looked at it. So I knew what we needed. Not what we wanted, but what we needed. So having coffee at a Starbucks with a fairly senior HR guy from this company, I said I love the idea of working for you guys, but it's gotta be between X and Y. When the called and made me the offer, it was pretty funny. It didn't even hit me until after I'd talked to my wife a little bit. They hit right in the middle of it and they included the bonus. To include the bonus to me was a foreign concept. The base pay and the bonus put together were right in the middle of what I told them I needed. I didn't know it at the time, but that's much higher than they normally start people. Mark Mattison: I did do exactly what I was told in ETAP. I said hey, why don't you come back to the ... in ETAP we were told there's always more money on the table. I said, you know what, I'll go talk to my boss, my lovely bride, and you go talk to your boss and tell him I need a little bit more than that and see what they can come up with it. They came back and they said no, that's our offer. It kind of gives you a feeling for how H.E.B. does it work. If they get something from you like they got from me, oh this is what I need and I didn't realize that would be the offer. Once they feel like in good faith they make that offer there isn't any negotiation. They're letting you know that if you want to work for H.E.B. this is what they'll pay you. It worked out really well. The pay increases very fast. The top end in a very successful retail company is higher than I could imagine. Hopefully we'll get there. Curt Sheldon: Okay. So I guess I'll scratch out my question on salary negotiation. It was pretty much here's your offer. To tell you the truth, my sample size is pretty small, but I'm getting more of a sense of that in a lot of cases I think may be more true than a lot of us think. That the offer's pretty much the offer. We'll see. People keep telling us. You said after walking the store, which I think we would probably both agree you were in an interview during those, it just wasn't formal, but there was a formal interview process. What did that look like? Mark Mattison: You're exactly right. I was smart enough to realize every one of those guys that I walked with was going to be contacted and asked, what'd you think? Even the senior HR guy, I believe, was is this the kind of leader we want in H.E.B. and they're very, very serious about the culture. It's a company that's culture centric. They're very aggressive and they're very good at business, but they're so concerned about the culture. That I think was more of an interview than the two formal interviews. They normally have a three interview process. They brought me in ... this poor junior HR gal, she started asking me questions and I think she thought we were going to be there for 20 minutes. I was so over prepared and you can tell I like to talk anyway. I think we went an hour and fifteen before she could finally get to the last question and get me done, get me to stop talking. Mark Mattison: I go away and it's really funny because I expected a call hopefully at some time and there's just absolute, total silence. No indication of when the next one will be. Behind the scenes they've got these people that just are running hundreds of millions of dollars worth of sales each week from 20-30 stores. Each one of them, there regional directors do really the more important interviews. So they're trying to schedule these people and get all these interviews to work and it's a non stop process because the company's growing. If you're the one transitioning, waiting to be interviewed, you just hear nothing. And you wait, and you wait. And one guy, while he was waiting, had Starbucks get ahold of him and he decided to go to Starbucks because he hadn't heard from H.E.B. It was the worst mistake he's made in his transition because he got hired by Starbucks, did not like their culture, came back to H.E.B. and H.E.B. said you know, we were interested in you. We had you in the process, but you took a right turn and left the process so yeah, we're not interested anymore. Mark Mattison: It's just kind of that feeling that he gave them a feeling. I was waiting for the second interview. They finally called. It might have been three weeks, four weeks. A lot longer than I expected. They called and said yeah, we're not going to do the second interview. We're just going to go right to the final interview, the third one. And that was with a regional director and it's a whole story in itself, but let's just boil it all down for your sake. I'll say, I thought I was handling this guy like you would a CFE in a check ride where you talk as long as you can and you ask them questions and get them talking as long as you can. You minimize the number of questions you have to answer. Mark Mattison: The guy got to about 50 minutes of an interview and he just started beating on my resume on top of his desk and he said, why? Why a grocery company? Why a guy with your kind of experience around the world, around large organizations? Why not Valero, a big oil company? Why not some other large company? Why H.E.B.? And that's what he wanted to know. That's what they wanted to know. Was there something they hadn't figured out already in eight months ... and by the way, the launch to that final interview was eight months. He actually interrupted my answer and made me angry. I think just to see how I would handle that. I showed him my hand and said stop. You need to hear my answer. Because my answer's built off what I believe and what I'm looking for and I think your company is it. Mark Mattison: I want to be proud of the company I work for. I spent my entire adult life in the number one air force in the world. Why would I join somebody that's not number one? Why would I join somebody that I couldn't be proud of? So we went from there and in the end, I ended up getting the job. So, that's what the interviews looked like. Curt Sheldon: Okay. I actually hadn't heard that part of the story before so that's interesting to me. I have heard a couple other interviews, lessons learned from you maybe from other people's interviews or things. Any lessons learned that you might want to pass on? Mark Mattison: Oh, for interviewing, yeah, you betcha. I'm sorry. I don't have these written down. Let me go down some of the guyes. Working with H.E.B., I was so proud of the company immediately. I was like a cheerleader and you've heard me. I had a lot of people start flooding to me to try to see if they could join H.E.B. so I helped a lot of folks get into the interviews and then stayed in touch with them throughout. A few got hired. Not very many, but a few got hired. Some of them that did not were very close friends of mine and some of the mistakes they made were epic and I think they would be mistakes with any company. Mark Mattison: One, a guy walked in, it's a retired colonel, and he said ... he got to the end of the interview and it's interesting. I believe he relaxed and that is a ... you want to be relaxed, you want to be fun. I always say you want to be the one candidate that they'd like to hang out and have a beer with. That's just in general. You don't have to be a drinker. You need to be relaxed in yourself and you need to remember to smile. A lot of military folks are very serious and when they're serious they don't smile at all. That doesn't work very well in a company like the one I enjoy. They want somebody that's fun. Like I said, it's all about people leadership so the person who is intimidating and doesn't smile, that's bad. Mark Mattison: The second thing is if you relax too much and you get to that fateful question, do you have any questions for us? And you start asking questions about just how high they think you can make it in the company and then you sort of work in that you see yourself here ... you don't even know the company and you don't even know the business yet. You make them real uncomfortable because they all the sudden think this guy doesn't have a clue. He doesn't know what he's talking about and now he's making us uncomfortable and we have so many people that want to be with this company. Anything that makes us uncomfortable, we just kind of go yeah, no. No thanks. And we move on. Mark Mattison: Another one ... and this guy is funny. As a person you don't think of him as a strong willed, aggressive guy, but in the interview they gave him a standard question for this company which is tell me about a time when you led a team of people to accomplish something big and then what it was that you accomplished. Tell me about your leadership. And they kind of work that in. What they really want to hear is you did lead a team, you did accomplish results, but then really what was it about your leadership that got the team to achieve those results? His answer ... and I love this guy, but his answer had nothing to do with any of his own, personal leadership. It was that he was on a team that did really well. And then he truly relaxes too far and he says, well the generals really liked having me around because if people didn't get their job done I made them go away in a hurry. I'd just fire them. Mark Mattison: In a culture centric, people leadership based company, he was done. When he said something like that to me and I said, what? You said what? Hey buddy, don't expect a call back except to say they're moving on. I mean, it was sad. I was the one who told him he didn't get the job. I predicted correctly. Some of those things, relaxing, smiling. Don't relax too much so that you say things that are just not prepared and not something you've thought about. Be honest. Be who you are. Don't talk about firing people and don't ask them if you can be the president of the company in 10 years. That just doesn't work really well. Mark Mattison: Those are some of the things I've actually seen retired colonels, 06's, try that didn't go well for any of them. Curt Sheldon: Every time I hear you talk about smiling at H.E.B. I have to think to myself good thing I started up my own business because I'd probably never get hired there. Mark Mattison: You do have a serious demeanor when you're working. That's for sure. Curt Sheldon: Okay, we hit networking a little bit. Anything else? Bottom line was you probably would have never thought about H.E.B. if somebody hadn't said, “Go talk to that person over there”. Any other networking nuggets for us? Mark Mattison: It is incredibly powerful. When they tell you that resumes don't matter, I actually believe that. H.E.B. asked me before the final interview they gave me a call and said hey, by the way, do you have a resume? I didn't realize and they didn't realize that they didn't even have my resume up to that point. That's just a tidbit. The power of networking is real. When they tell you, you get more jobs through networking versus filing your resume on an application, I believe that with all my heart. As I mentioned, I prepared very hard. I reached out and found people and made contact. Mark Mattison: One of them was a guy named Dave Patrick here in San Antonio. He's a well known retired 06 who helps people nonstop. He gave me a bunch of ideas. One of the things he said was never hesitate to tell somebody that you're transitioning and what your goals are. No kidding, within about a week or two I put on my long cargo shorts and my Hawaii shirt. I was off to visit the University of Hawaii, the ROTC unit there. I'm flying from San Antonio to Dallas feeling kind of goofy because everybody else ... it's December. You always save that trip for December. I get the middle seat standard government fare. Mark Mattison: This lady was sitting next to me and she was probably, maybe 30 years old or very early 30's and very attractive and very professional. Very business like. Her suit would cut you if you got too close to it. I look at her and I hear his voice saying you always share ... you know, every chance you get share and I went nah, I'm not talking to this lady. No way. She's gonna think I'm that creepy old guy. Easy. No comments from the crowd. So I didn't. I just sat there and I read a book or something or read emails. We were about 10-15 minutes out from Dallas and she was trying to get her work done and she tipped everything over and most of it fell on the floor in front of me. So I dive for it, tried to do the right thing and I give her everything. Mark Mattison: I hear his voice again, you know, never hesitate to tell somebody that you're transitioning and share your goals and what you're looking for. Because I helped her, she asked me a couple questions. The standard traveling questions. Where are you headed? What do you do? So I went for it and said here's what I'm doing and here's what I'm thinking and here's what my goals are. She was very nice and we found out that ... I reciprocated and she told me what she did. It had a lot to do with what I did what I did in Base Realignment and Closure. So I start giving her the second, third layers of detail on assessing the value of buildings and whether to tear them down or build new ones just to kind of prove I knew that particular business. Mark Mattison: I gave her my cheesy at the time ... I mean, it was cheesy, business card that I had printed myself with an F-16 on it and all these kinds of things. You know, stuff you don't really need. Walking away I felt like hey, I did it. I told somebody this networking thing. I'm gonna figure this thing out. Mark Mattison: Fast forward to Hawaii. The next day I wake up very early because of the time change, get on my email because I'm a commander, and there is an email from that young lady's boss who basically said we are very proud to hire veterans. It was CBRE. I don't think there's any reason I need to keep from saying that. Coldwell Banker Richard Ellis, I think is what it is. Mark Mattison: But the bottom line is the guy was offering to help me transition and telling me that CBRE is very proud of the veterans that they hire and they thought they probably could find, according to what the young lady had told him, find a position for me. They wanted to assign a talent coach to me to help me. I went there about a month, month and a half, two months with them stepping through their process. Most of it would have required me to travel all the time or move and live somewhere else to make it make sense. I wasn't really sure that was work I wanted to do. It didn't really fill my continue to serve bucket, that goal that I had for myself. It also just didn't quite feel right. Mark Mattison: H.E.B. from the very first minute people started telling me about it and when I'd walk stores and walk them on my own, it was the feel ... I think it was the culture that I was feeling. How every partner reacted when you asked them about the company. Couldn't find anybody that didn't like the company and I tried hard. Mark Mattison: CBRE on the other hand was different. The point of networking is I woke up less than 24 hours later and I thought man, this networking stuff, this is powerful. It truly can be if you are prepared when the opportunities arise. Curt Sheldon: Yeah, I've heard that story before and I always find it interesting. So I'm a money guy, as you know. You talked a little bit about the fact that you knew what you needed to make the transition. Any other money thoughts, obviously without any real detailed ... you know, any surprises either good or bad or things that were maybe a little different than what you thought they might be? Mark Mattison: Probably two things. One, I didn't follow all the rules. While I had the budget ready, we didn't do things that you should probably do if you want to have a disciplined transition that's relaxed and stress free. We bought the really big house, two big cars. We did all the things you're not supposed to do just because you're retiring. To be honest, it leads into the ... all that really did was ... the point of saying that is there wasn't any extra money in my budget. At every step I consulted my budget to see if there was enough money there to do something, but I really didn't plan like somebody like you would teach me on contingencies. Mark Mattison: That kind of leads to the second piece. At the age where we're transitioning from the military is probably the age where your kids are getting to college or whatever. Maybe wanting to buy their first house. It's also the age where your parents probably are getting to the point in time where if they didn't have somebody like Mr. Sheldon here helping them, they might need help as well. Mark Mattison: All of that came to fruition in my life. I have two kids in college. Neither one of them knows how to read a rental agreement very well so we ended up in a couple of rental agreements that needed a lot of money to buy them out and my mother needed help and, and, and. So not to get too specific or too personal in case any of them ever listen, it really did cause big stress and a lot of financial hardship. But it was one of those things where in every case you're not going to look away or say no, I can't help you. Mark Mattison: I think if I had something to say on money, it's first, be very disciplined about that budget and have it and have it ready. Down to the penny if you can. What's cable going to cost? What's internet going to? Every single thing you can think of and then add whatever the planning factor is that somebody smart like you might tell them. Add those planning factors and take them serious and reserve that money for the things that you don't normally deal with when you're owning a new home or owning a home that's off base for the first time in a decade or two. And then plan on contingencies that have nothing to do with you. You may be solid and happy and wonderful and everything's great in your life, but there's other people that you might want to care for that require some financial resources as well. That's the thing I would add. Curt Sheldon: Okay. Thanks for that. As I say pretty much in every podcast, there's nothing 06's like better than the opportunity to pontificate. I'm going to give you a few seconds here, no question here, just anything additional that you'd like to add in. Mark Mattison: You know it's just interesting. I think for my part, and I think it's already self explanatory or has been explained already, the old adage find something you love doing. I didn't know I would love doing grocery, but I did know I liked talking to people. I did know that I liked budgets. I did know that I loved the idea of making money. I also like security. I wanted a large company that ... not something that I put in my goals, but it's something that I knew about myself. I wanted a large company that wasn't going anywhere. I knew that I wanted the security of not worrying about the next paycheck. Mark Mattison: Entrepreneur is nowhere near my skills and desires. You and I have a personal friend that's an entrepreneur and there's no way I could have done it. I would have been a basket case. Mark Mattison: Knowing yourself I think actually is worth some real thought. It worked out great for me. That's why I haven't changed jobs. It's why I only have one job and I'm not going to change jobs. I'll be with this company until I retire for good. I think knowing myself and what I wanted went a little further than the goals and things I discussed. And knowing what my real skills were, my real strengths were. Mark Mattison: One of them is ... you shouldn't be able to say this about yourself, but that I knew I could bring a humility to the next job because I understood it didn't matter that I was an 06 in the Air Force. There are no airplanes, especially fighter jets, in H.E.B., a grocery company. So I realized and knew I would need to start over. While they were paying me as if I knew a lot and brought a lot to the table, even then it wasn't anywhere near what most colonels are looking for, I also knew that I had to have the humility ... that more or less I was a second lieutenant again. While I had potential, I had no experience or training and I needed to get that as fast as I could. Mark Mattison: So when I got to H.E.B., I actually walked the store, but I worked and thought to myself if there's a piece of trash on the floor and another partner's going for it, I need to beat them to that piece of trash. They need to see me picking up the trash. They need to see me going after that bottom shelf to fix it, where you have to get down on your knees. If they see me ever standing around with my hands in my pockets ... and you know what, at least one of the colonels, if not two, that I helped get a job with H.E.B. that are no longer with H.E.B. did that and it became noticed very quickly in a blue collar industry. Wow, guy stands around with his hands in his pockets like he's still a colonel and talks about how good he's going to be at the corporate level when they all knew, everybody but the retired colonel, there's no way that retired colonel would ever make it to the corporate level because they didn't understand the work and they didn't understand what it took to be successful. Mark Mattison: I knew from the beginning I had the right company and probably the right position, but that I didn't bring any value to them so I needed to hurry up and get it in gear and bring value. Mark Mattison: I think humility is something we don't talk about. We build each other up when we talk about transitioning. I often go into ETAPS and tell them you're not worth 100,000 dollars a year. Some people might find that, but rarely, I think, does that actually happen as a starting salary unless you, no kidding, have it lined up and you've lined it up for two or three years in a specific company or a specific GS position. Even then, that's hard to do. Mark Mattison: I just don't think we're worth what we think we are. I think you need to bring a humility that accepts and acknowledges the fact that you don't bring value to your new company most likely and you need to hit it like any other time when you were the new person in the squad or in the wing and learn as fast as you can and bring value as quickly as you can. I think that was one of the things that helped me and there's a bunch of colonels that have been with H.E.B. and left because they just didn't quite understand that. Curt Sheldon: Okay, thanks. So to the best of my recollection we're connected on LinkedIn. Are you okay with folks reaching out to you on LinkedIn to connect with you? Mark Mattison: I am, but honestly I just don't do much with LinkedIn. My work email is mattison.mark@heb.com. My personal email is snapperf16@gmail.com. Those two are the only way you'll get ahold of me. The work email, maybe sadly, is by far the ... I'm the most responsive to because I check it every day. My personal email has not become as important to me or is not as important to me as it used to be because my kids are off and they don't email me. My wife doesn't email me. And apparently when my friends email me I don't email back so I have to get text messages and things. Either one of those will work for anybody trying to get ahold of me and the H.E.B email I'm more responsive to. Curt Sheldon: Thanks Snapper for putting that out for us. Okay, as we wrap things up I'm going to go to my go to last question and you've kind of dance around a lot of this already and talked around it. But very specifically, if you went back six to twelve months, you're sitting in ETAP or you're sitting in your office, what would be the one thing that you know now that you wish you would have known then? Mark Mattison: Gosh. I would have probably pulled out the piece about contingency planning for money or I would have pulled out the humility discussion for the most part. I think that ... well, six to twelve months prior I would have definitely told myself you're gonna love it. It is awesome to have more resources than you've ever had before because you've got the pension now and potentially a VA disability check and your new job. So you have resources you've never had before. Don't get so carried away with succeeding in the new job that you don't have some hobbies and don't do some other fun things. Mark Mattison: I hit it like I do everything else. I was all in all the time and actually decided at one point after about two and a half, three years, things were going well and I thought you know, I don't have any hobbies. I'm not having fun when I'm not either specifically with my wife out on the town or with my kids or at work I enjoy all the time. I needed to come up with some things so I started writing and doing some other things that really are a lot of fun. I think I would tell myself it is really good in retirement, but you gotta prepare for the transition piece. You do your very best, you'll find what makes you feel good and you can provide what you need. Mark Mattison: And then also be humble and make sure you have fun. Make sure you do something that keeps you happy as well. Don't just go out and make money. Curt Sheldon: All right Snapper. Well, thanks so much for spending the time with us today. You got a lot of good stories. Even though I've heard most of them a half a dozen times, they're always good to hear again. I really appreciate you spending the time with us. So, thanks again. Mark Mattison: Thank you for serving everybody that has come and will come. I think what you're doing is really important. Thank you. Curt Sheldon: All right. Take care.